or why this time, for once, I should have listened to my mother. I finished the brown cardigan. I can wear it with another sweater underneath. Which I’m doing all the time anyway. Because I’m always cold. Some of you might recall that this cardigan had been almost finished in July or so, and since it was way too small I decided to frog it completely and start over again. Because I am a perfectionist and also a bit too obsessed about all this knitting stuff. I even made a gauge swatch. With three different sizes of needles. And then I knit it all over again with needles one size bigger (or 0.5 mm in my case). It wasn’t exactly happy knitting at this point. With this endless chocolate brown diamond pattern, all those irregular decreases, and the yarn all wavy because it had already been knit … (What? You mean I should have washed the yarn before re-knitting it? Very funny. Yes, I have heard that some people do things like that. But then, there are even people who have tongue-piercings.) Also I knitted a brown lace stole at the same time. There came a time when I just had to knit something else in a different color. But then, in January, I promised myself not to start anything new again until I had finished some of the on-going (or better “on-waiting”) projects on my knitting needles. I made it all through the sweater by sheer force of will, and by carnival I was ready to wash and block the finished cardigan pieces. I washed them. I wrapped them in towels. I borrowed a rug from my husband. I fetched my pins and my tape measure. I laid the wet sweater pieces out on the floor, took my tape measure in hand, and – the pieces were too big. I almost fainted. So, I could have finished this cardigan months ago and in the meantime finished the next one for sure. Grr. On the other hand that keeps me from spending even more money on yarn. 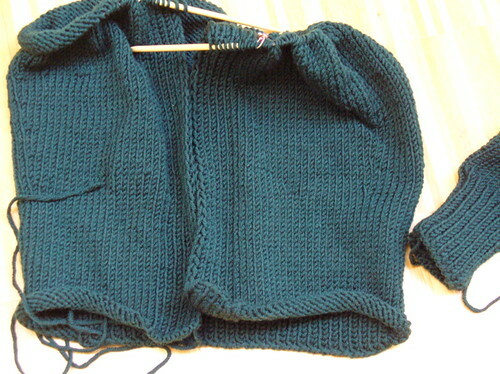 The next sweater already got started, it’s called “L’il Red Riding Hood” by Jennifer Stafford. As much as the thought of a red hoodie appeals to me I’m making it in green so that it goes with everything I own. This time, by the way, not only did I knit a gauge swatch the size of half a pullover, I measured that thing and then washed it, let it dry, and measured it again. Which means that right now I’m knitting a sleeve that is barely big enough to slip over my wrist. Fun! But then the gauge swatch spread out considerably after washing. Also since I had to use another yarn the gauge doesn’t match exactly. I’d need more rows. But then I’m changing the pattern to be knitted seamlessly and so the whole thing probably will get longer and longer over time. This would be the socks I’m currently knitting by the way. I absolutely love the colors. 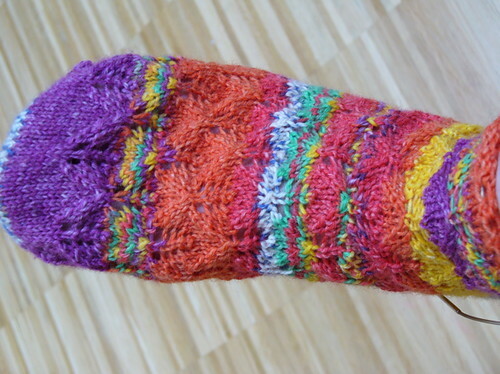 It’s self-striping sock yarn inspired by a Hundertwasser painting. The pattern is called “Elfine’s socks” by Anna Belle. So. About all this swatching. If – in my last ten knitting projects or so – I had just taken the yarn, the recommended needle size, and made it in a size M everything would have been fine. If I had just not looked at the thing I was knitting before blocking I could have just gone on and on. No problem. So for me it seems I can either knit something like three swatches using different needle sizes, wash and block them, or I can go ahead and make that thing just the same and not waste two days. The only thing that swatching helps with is the not agonizing about whether it will block out or not, but to be frank, even though I have experienced how the yarn I’m currently knitting with gets bigger and loser after washing I’m still not sure whether the really small sweater I’m knitting now will fit me in the future or not. So, don’t try this at home. To be a good knitter you always have to knit gauge swatches and measure everything very carefully. Do you hear me? I would love to say something awesome but all I can think of is I love the colourful sock. It is too big, but well done, and the colour is great on you. Look at all those geeetars! hele is right. she stole my words. Damn, that must have hurt to say that thing about your mother. It would kill me! The sweater looks quite good. maybe it would fit me????? Best looking sock in all of southern Germany. Is you house temperature kept down to cold, or do you freeze no matter what temperature it is? Good looking sweater, and model too. I think the size of the sweater looks OK, but that’s probably because it is the end of winter here and I’ve become accustomed to huge bulky things in many layers. Just reading about the whole process gave me a headache. I love the sweater. I am always too lazy to knit a guage swatch. My sweaters are always too big. Sigh. I do love the socks you’re knitting. I’ve heard of self-striping yarn but I’ve never tried it. Are you knitting them on round needles or 4 straight needles. I’d love to learn socks someday. Those socks look way cool! Hi there! I just stumbled on your blog though google. I love the sweater, even though it is too big. I could never manage knitting try as I might. Even my scarfs turned out wonky!! Anyway I like your blog and will visit again! well, it’s all beautiful, at least! I love the colors on that sock. Nice work! secret of the stole, or on being proud and happy Why I write. And how I started it.